A solid majority of Americans polled want to see a third party compete with Republicans and Democrats. On a range of issues too, the public is well to the left of both the ruling class parties. So why hasn’t the Green Party taken off and made itself a contender? The answer is a mix of internal and external reasons. The external reasons are easy to spot though immensely difficult to overcome. Republicans and Democrat have drafted laws in a third to half the states with the explicit intent of banning parties outside the ruling class consensus, banning third parties from appearing on ballots alongside their Democrat and Republican competitors. This is the purpose of petition drives and other requirements imposed upon third parties which they Dems and Repubs do not apply to themselves. 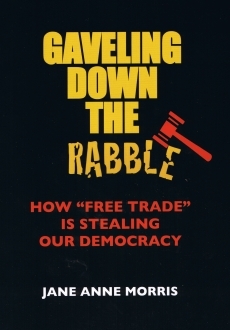 Morris lays bare the "free trade" zone established within the US by the Supreme Court.